Pause Game. The land area has plenty of farmland to sustain a reasonably large city with both food and clothing. The amount of population needed equals few houses so villas will not necessarily be needed. Since all trade routes go by water the coast line has to be reserved for trade ports. The only resources to produce are clothing, olives and grapes but they are enough to max out insulae and evolve domus once. That means I don't need to import pottery. Clothing gives a better return from exports than grain and wool so I decide to go for that. I build 2 sheep farms (4 fields), 1 grape farm (2 vinyards) and 1 olive farm (2 groves) on the western farmland to have the resources ready after roughly 6 months. The preferrable trade route to open first is Apulia to be able to export clothing and, when needed, import pottery. 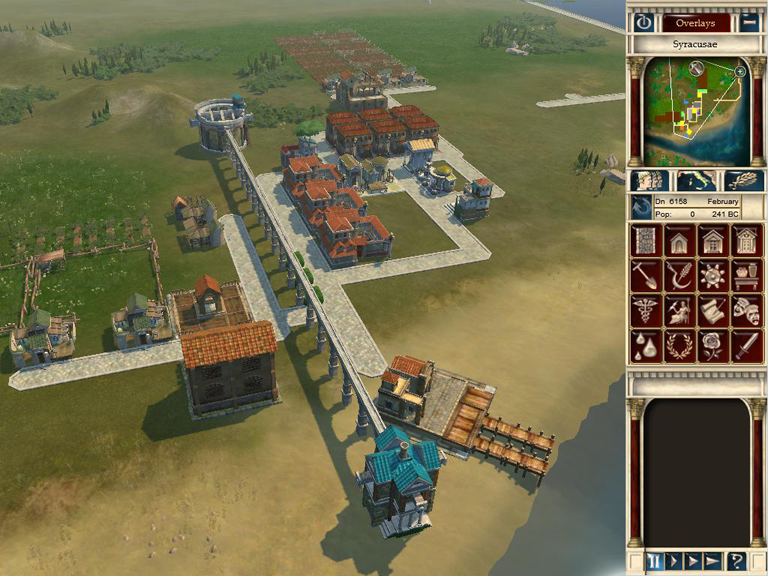 I build the trade port (mothball) near my sheep farms to reduce the walking distance for my workers. A warehouse (mothballed) goes neatly close to my sheep farms for future use, as well as 1 clothing factory. I place 2 grain farms and 2 vegetable farms on the northern farmland. I build a small housing block of 6 insulae and 3 domus. A food market (mothballed) is placed near them and I connect the block to my "food road" where I also place a granary (mothballed). The block also get 1 god (Jupiter), fountain, prefect, engineer, clinic and a tax office (mothballed). The settings in the advisory Labour screen is set to prefer prefects, engineers, harvesting, healthcare and water services. The export limits in the advisory Resources screen are set to 2 for clothing and 5 for grain and import for pottery and furniture is set to 2 for both. Unpause game. Watch immigrants settle and open up services as the population increases. Don't forget to open the tax office! The first demand from Rome comes in August. They want 10 grain and the deadline expires after 1 year. I ship it almost immediately. By June the grapes and olives are ready so I build 1 olive oil factory to sell to my population and faster evolve my insulae. As soon as I have oil I build a basic goods market. I also decide to temporarily mothball the full grape farm to make use of the workers in a second olive oil factory. By September the wool is ready. 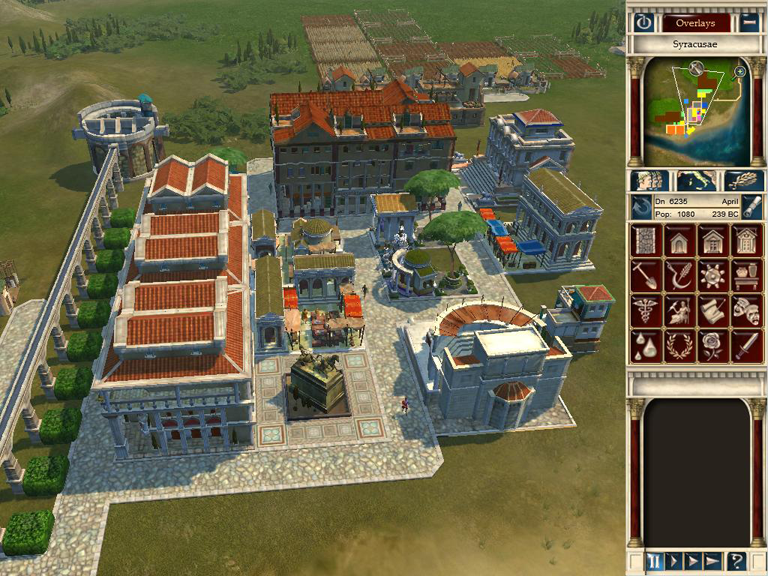 At the same time 2 insulae evolve and offer more workers so that the clothing factory can open and start production. I also build a second clothing factory. In January all insulaes have evolved at least once. With more workers the warehouse and trade port can open. It is also time to build 1 more vegetable and grain farm to keep a decent stock. A promt tells me I have enough grain to send to Rome so I do just that. In February I have enough workers to reopen my grape farm and build 1 wine factory. In March Rome sends another demand for food. It is ignored for now. More people immigrate, which means I can build a luxury goods market, 2 more clothing factories (4 total) and a second wine factory. In June the domus have evolved. There are now enough workers for an odeum. I "move" (delete and rebuild) the clinic to fit my odeum in its place for perfect coverage. 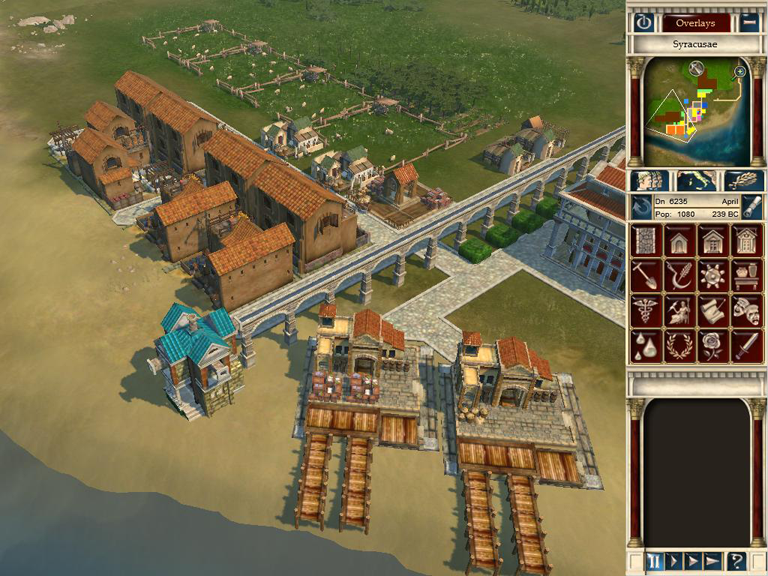 I have some stock of wool so I decide to open trade to Latium and start exports. In September Rome demands grain. My farms are completely full so I build a second granary. I stockpile grain breifly and then ship the goods. At the end of the year a library is built to meet the cultural objective. The year of waiting! All requirements have been met except favour. Since I don't want to waste money to please Rome and spend it beautifying my city instead. In March Rome demands 30 grain. I stockpile and then send the shipment. This is enough to win the scenario.